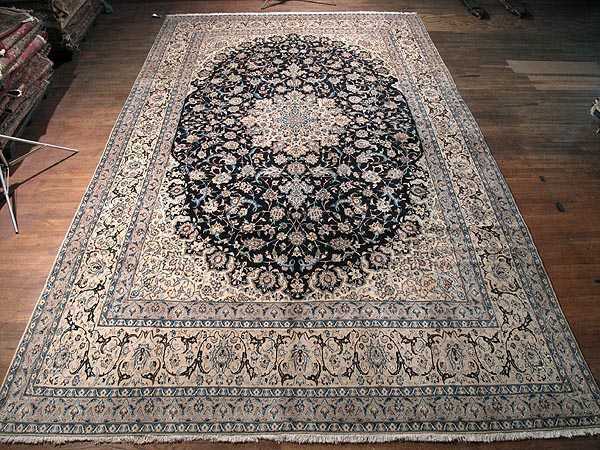 For almost two years this Persian rug never stopped to amaze everyone with its beautiful Rosette motif used in the center of its medallion based layout. Although it has such a large dimension (10'1'' x 16'8'') it has thousands of small Mina-Khani and Shah Abbasi motifs. The pile is a combination of wool and silk which contributes to a greater visual experience (especially because of using silk). The characteristic color is Navy combined with muted tones of beige and with black for creating contrast. From the Iranian Nain town this 171 knots per square inch Persian rug can best suit your traditional style designed library or study room.